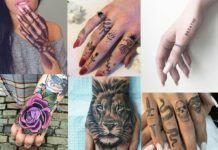 Choosing a tattoo design is an incredibly personal decision, you’ll want to make sure it’s a word or image that you absolutely adore and want to live with forever because once it’s on, it’s on for good! 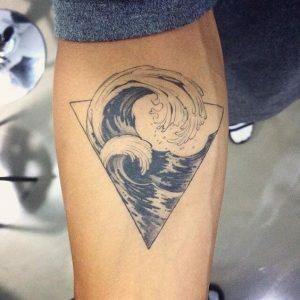 Now that the days of anchors and tribal cuffs are all but over, many look for a more modern, sleek shape when choosing a design. Triangle tattoos with their clean lines and sturdy appearance are surprisingly versatile and can be the basis of/incorporated in to thousands of amazing designs. Just take a look at these 30 inventive examples to help you decide on yours. 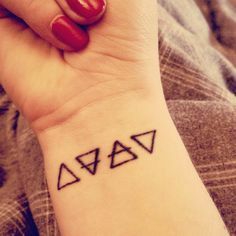 With three equal sides, triangles and therefore triangle tattoos are often used to show ones belief, love and adoration for a certain trinity. In Christianity for example, it may represent the father, the son and the holy spirit. For others it may be mind, body and soul or the link between two parents and their child. 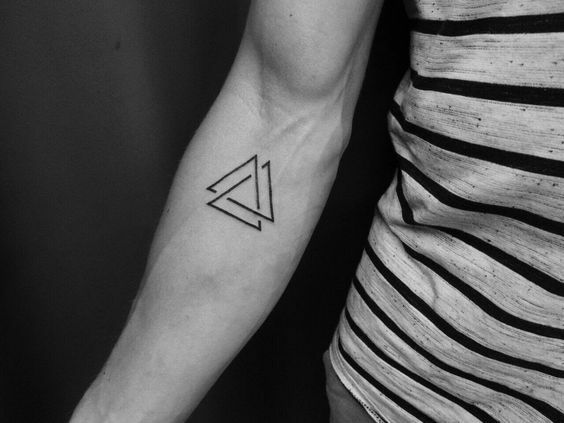 Some choose triangles simply for the seemingly unbreakable shape and the sense of strength and unity it represents. 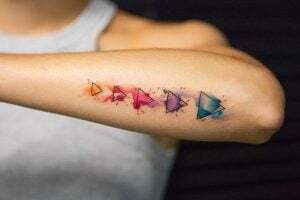 Alternatively, you will also find triangle glyph tattoos that represent certain emotions like love or hope, or elements such as earth, wind or fire. 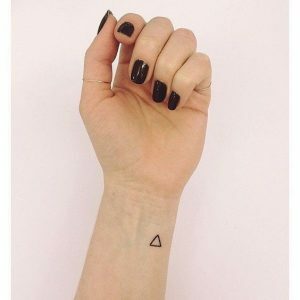 Whichever of these is the reason that you choose a triangle tattoo, the outcome will be a striking image of eternal strength and beauty. Perfect for lovers of travel, this simple tattoo depicting a sunrise over rocky mountains is uncomplicated yet full of excitement and wonder without the need for colour. 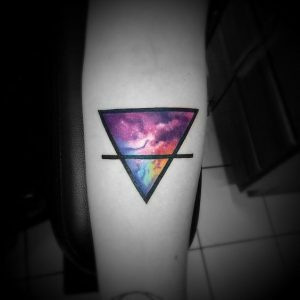 In today’s society, we have come to know the depiction of a rainbow as the symbol of LGBT pride. This colourful image being seamlessly injected into the triangle shape, a symbol of strength and unity is a very beautiful way to show your love for the LGBT community. 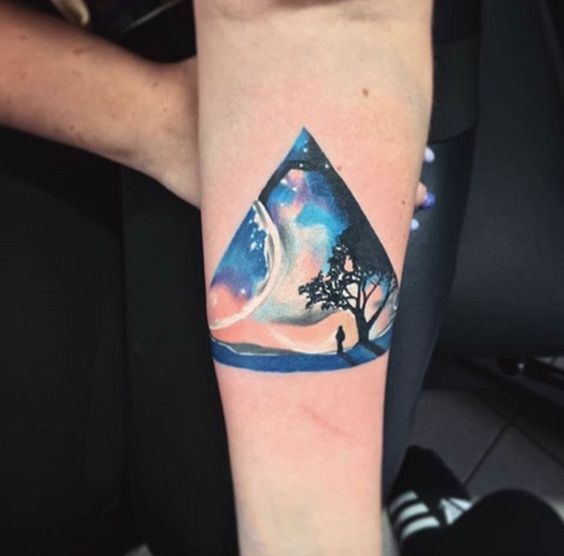 This particular glyph symbol means, “transcend” so it’s fittingly beautiful that the artist has filled the inside with this stunning watercolour image of a far off galaxy, allowing their client to “go beyond” each time they look down at their artwork. 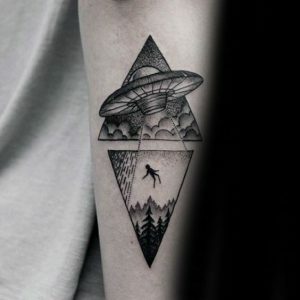 Those fascinated by the extra terrestrial can use these amazingly creative, connecting tattoos to artfully exhibit their belief in life on other worlds. The use of two triangles connected by a beam of light from the UFO is a fantastic way to unite these two triangles. 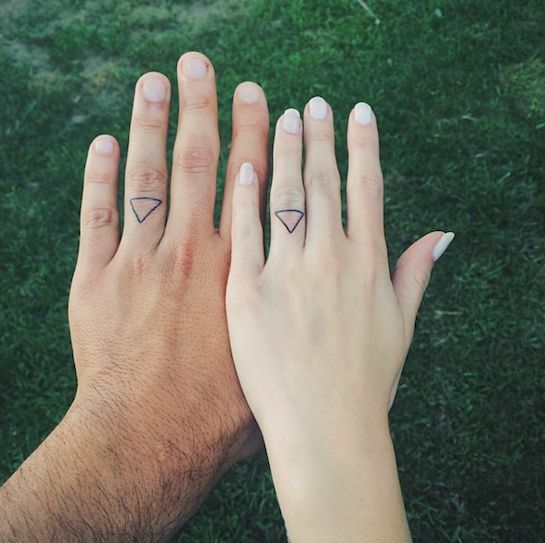 Perhaps you’re just starting out with tattoos or you’re wanting to subtly add to your collection. Either way this small, simple triangle outline is perfect. Only you will know what those three connecting sides mean specifically to you, you can choose to share that knowledge or keep it all to yourself. 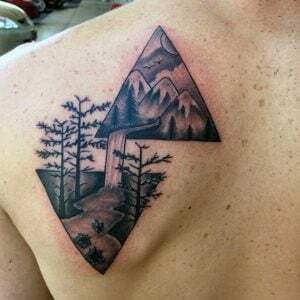 Another wonderful option for those with a serious case of wanderlust, these two triangle scenes connected by a river flowing through each depicts nature untouched by the modern world. It’s enough to make any avid traveller hungry for their next adventure. 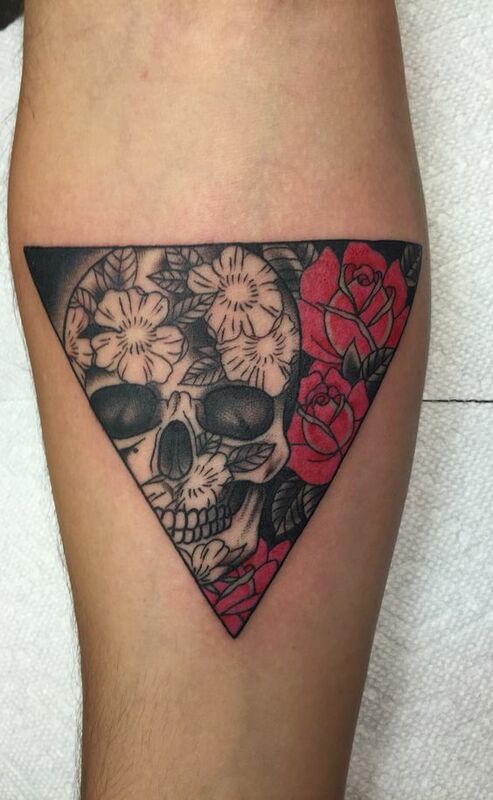 We’re used to seeing sugar skulls and flowers in a more wild depiction but here they are confined to the triangle shape which gives this tried and tested design a whole new meaning. If you’re looking for subtlety, a palm tattoo could be a great choice for you. 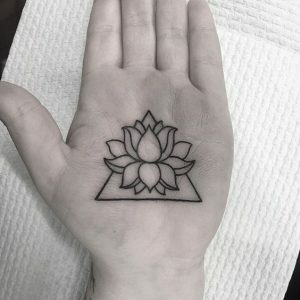 As a symbol of purity within the body and mind as well as devotion, enlightenment and re-birth, the lotus flower has many inspiring meanings. 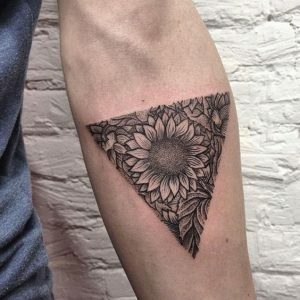 It’s perfectly fitting therefore that here this beautiful flower blooms beyond the confines of the triangle shape. 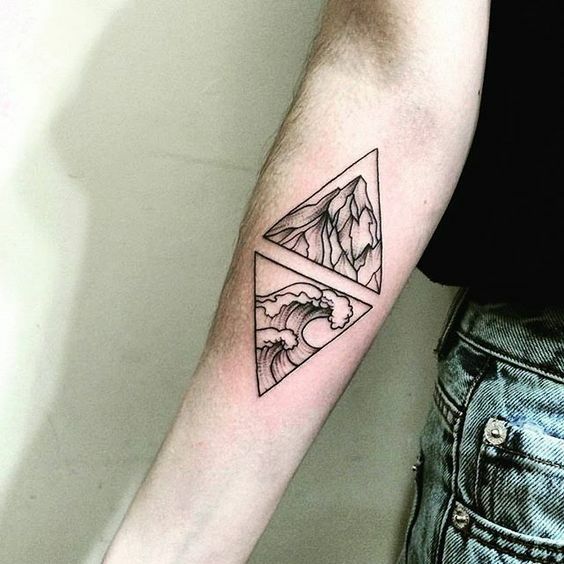 Choosing to depict fierce waves spilling over the constraints of a structured triangle excellently demonstrates the irrepressible, unruly nature of the ocean. It could also be used as a reflection of one’s character or a particularly unpredictable time in their lives. Stunning, rich colours are used to create these vivid scenes. 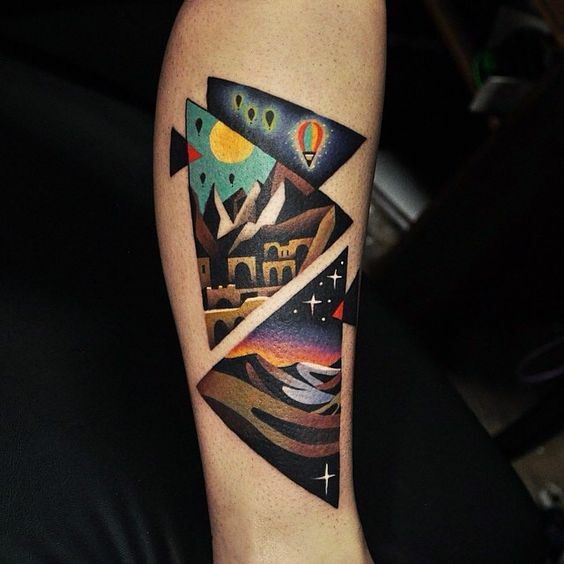 It’s a unique and beautiful design that’s use of triangles in various sizes and forms further enhances these beautiful, ancient city scapes and deserts. 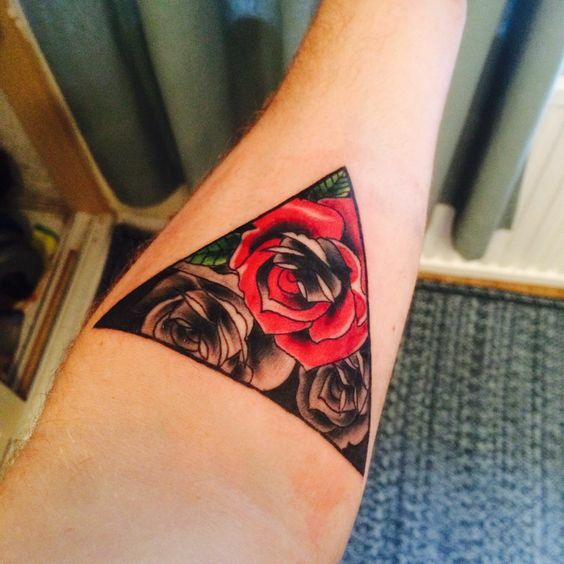 Roses, especially black and red ones are a time honoured favourite in tattoo design. This fresh take however gives a vintage concept a much more modern appeal. Red roses can symbolise love and passion whilst black roses may symbolise grief or loss. Combining both together in the shape of strength adds an alternative meaning opposed to if they were seen to be growing wild and free. 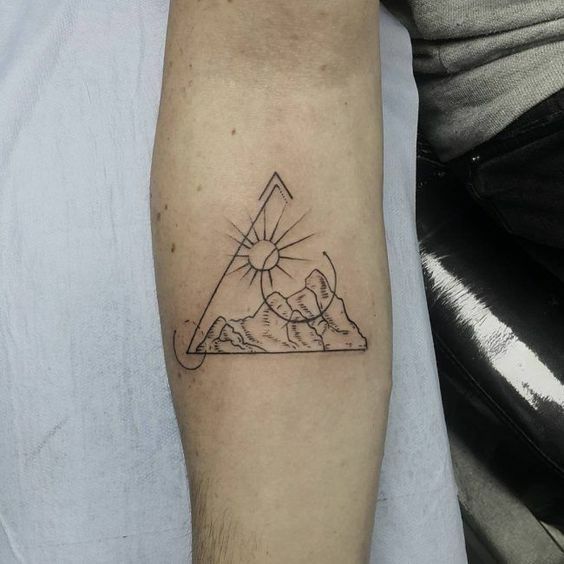 We love how these tattoo’s start out small and gradually grow in size with each new coloured triangle. 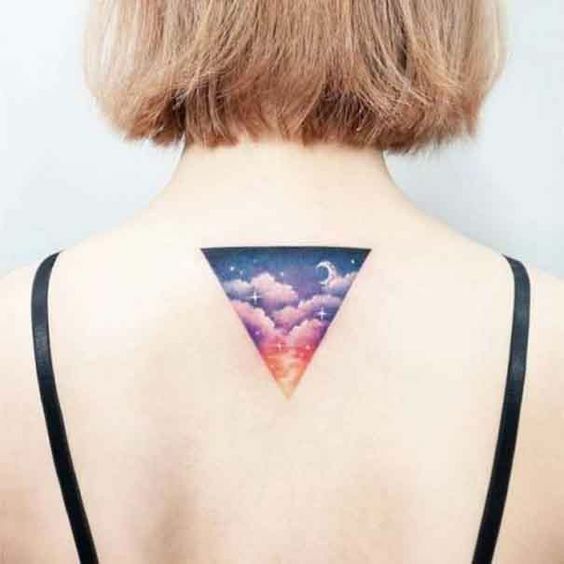 This is a great way to add some colour to your tattoos without too much fuss as the colours are simple but blend nicely in to one another. A great way to depict a growing love or adoration for a particular person or interest. 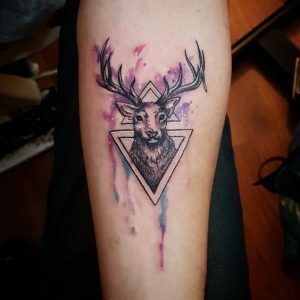 The stag is the king of the forest and protector of all creatures great and small, a most respected and long admired animal indeed. 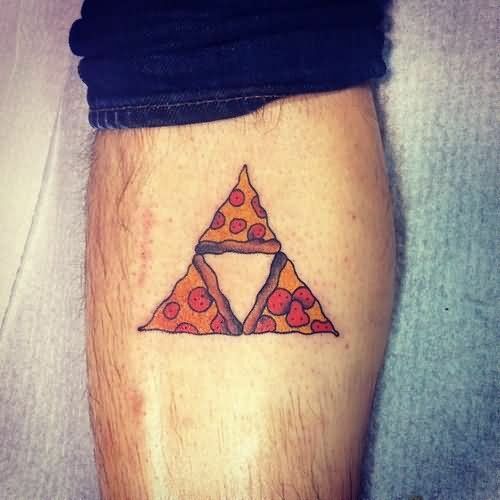 Just like the unshakeable triangle, he represents power, strength and virility. Another outer space themed design here. 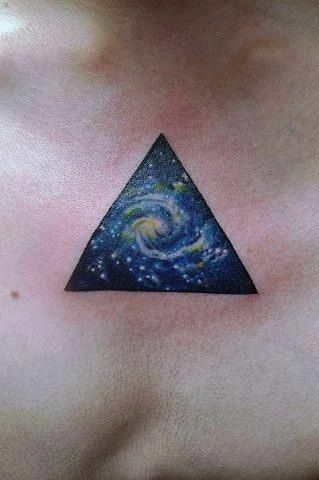 This time the triangle shape lends itself perfectly to the seemingly infinite, galactic swirls and shining stars in this striking tattoo. 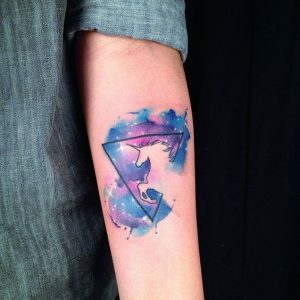 We’ve all seen our share of unicorn tattoo’s by now but this one offers something truly unique. We adore how the unicorn is pictured to be bursting in to the triangle shape and the gorgeous explosion of colour surrounding the impact. Glistening stars complete this dreamy design. When we think of sunflowers, a bright, sunny shade of yellow usually comes to mind. 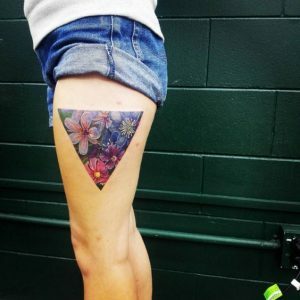 We love how this tattoo has reversed that idea and illustrates these usually luminous blooms in black and white, confined to a triangle. There is no border however which plays on the idea that these flowers could begin to evolve and grow. Usually when we see flower tattoos they are smaller than those we observe in real life. Not here, this breathtaking image is fully life sized and the triangle perfectly frames their existence like an abstract vase. Night sky tattoos have always been a favourite and this version with a figure under a towering tree both in silhouette is just breath taking. Full of wonder and hope, this perfectly demonstrates the idea that some take from the triangular shape, “feet on the ground, head in the sky”. 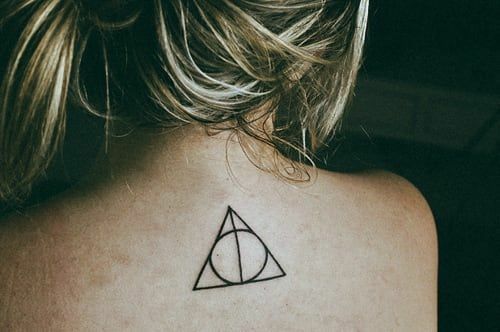 So many of us fell in love with the Harry Potter books and their subsequent movies. The magic and creativity they provide is as popular today as it was during its initial release and avid fans will adore this beautifully simple nod to the magical world of witchcraft and wizardry. Love jetting off to magical destinations every chance you get? 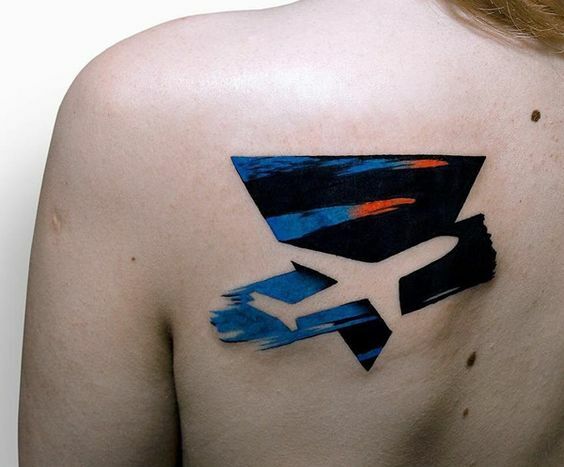 This stunning, painted plane effect tattoo is the ideal choice! We adore the unfilled outline of the plane against the deep shades of the black and blue sky injected with a sunset orange to lift the overall image, bursting from the seams of the triangle border. Calling all nature lovers. We think these simple, slightly shaded images of sky high rocky mountains and a thrashing ocean below are an absolutely perfect paring. For anyone who has ever dreamed of leaving planet earth and venturing to explore a planet far from our own, this is for you. A real celebration of our exploitative nature and inbuilt sense of wonder and adventure. The all seeing eye, also known as the eye of providence, represents God almighty watching over all of humanity. 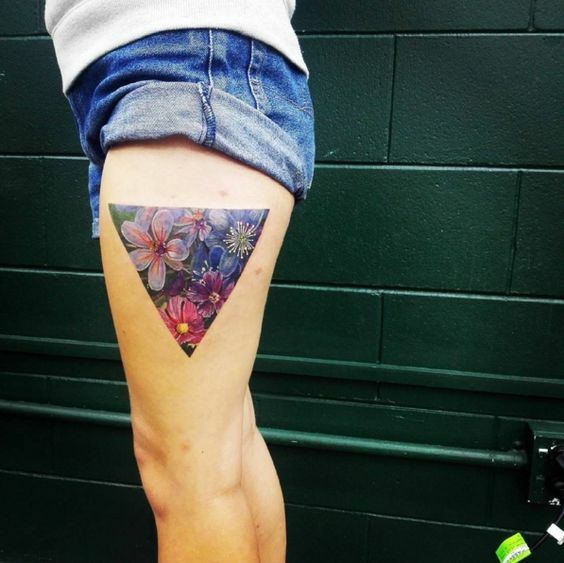 This is a popular choice for triangle tattoo’s but we especially love this uniquely decorative, colour filled version. The infinite triangle is a wonderful way to symbolise eternity, everlasting love or unwavering endurance during a particular time in your life. An understandably popular choice for newly wed couples, a triangle works in pretty much any shape or colour which makes it the perfect alternative to a wedding ring, ideal for those who’d prefer something a little more permanent to celebrate their commitment. 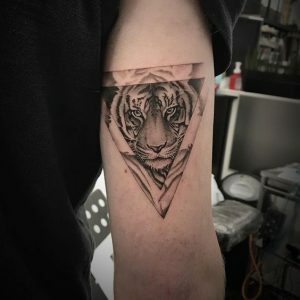 The triangular outline for this tiger tattoo allows us to really focus in on the strongest features of the animal and enhances its power. The shaded outer triangle softens the overall image but doesn’t lose sight of the main focus or desired, bold shape. This tattoo depicting the elements is beautifully streamlined as the 4 triangles slot in very precisely beside one another. Rather than specific names or phrases, this is a much chicer, more fashionable way to celebrate yours and your besties everlasting friendship. 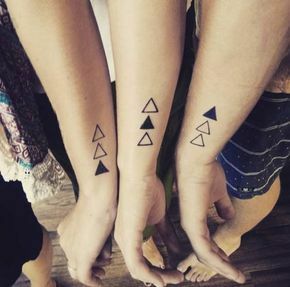 Each has a different triangle shaded out of the three which means your tattoo is unique but that you also compliment one other when shown together in a set. 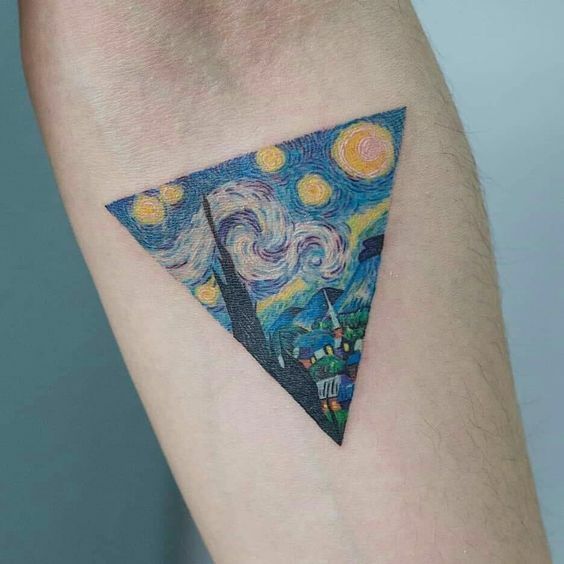 You can spend as much time as you’d like gazing at your favourite painting if you make the decision to have it tattooed permanently. 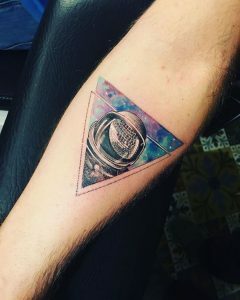 What better way to enjoy your most admired pieces of artwork than to have them become a part of you. If you truly have a wild sense of humor (or you just really, really love pizza) opt for this hilarious, if somewhat questionable pizza tattoo. 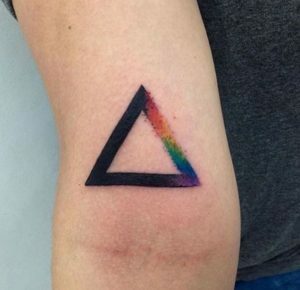 It’s not exactly chic but it is definitely in-keeping with a triangle theme! A freelance fashion and lifestyle writer, and part time stylist based in West Sussex.